So, let’s talk DC Minimates. Two weeks ago, I discussed Play Along’s use of legal loopholes to get out the first DC-based Minimates in the C3 Construction line. That line unfortunately ended fairly abruptly, leaving a very incomplete collection of characters. A few years down the road, DC Direct teamed up with Diamond Select Toys, creating an official line of DC Minimates, which offered a more diverse selection of characters. Sadly, it too was short-lived, lasting only eight series before ending, once again leaving certain groups incomplete. The diverse selection of characters ended up as both a blessing and a curse; off the wall characters were fun while the line was running, but after the fact the likes of Lobo and Ambush Bug, who I’m reviewing today, seem like wasted slots in a line that didn’t get us important members of the Justice League. 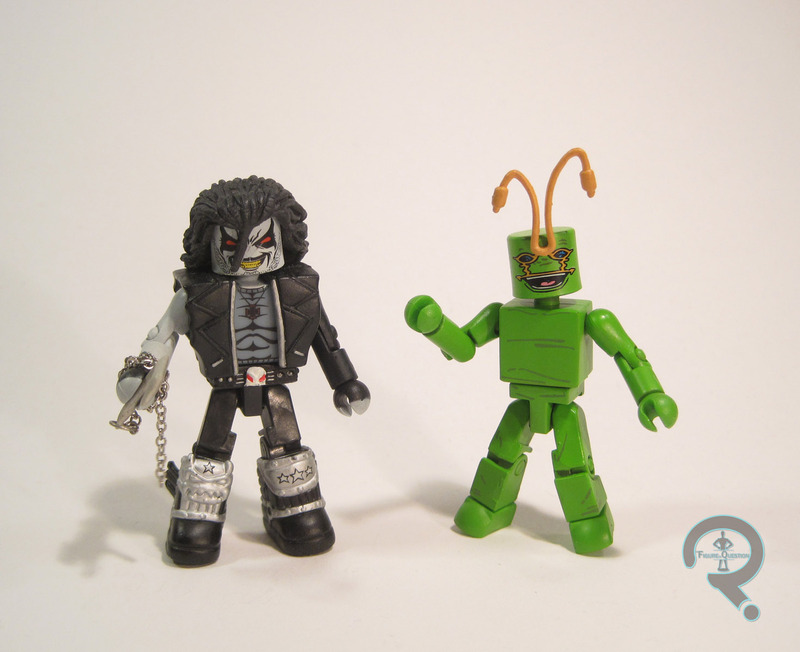 Lobo and Ambush Bug were released in the seventh series of DC Minimates. They seem like something of an odd pairing, since I don’t believe the two of them have ever interacted. Of course, they’re both weird, occasionally fourth wall breaking characters with a tendency to parody popular comics conventions of the time. So, maybe they aren’t such a bad pairing. Lobo is, by and large, a parody of grungy 90s anti-heroes. So, of course, he had a large fan base who missed the parody bit and took him as a straight character. I’ve never been much for Lobo, but I did have a soft spot for his teen-spin-off Slobo, who appeared in Young Justice. But, that’s neither here nor there; let’s talk about Lobo. The figure is a little under 2 ½ inches tall and he has 12 points of articulation (due to his boots removing the ankle joints). Lobo has 5 add-on pieces for his hair, vest, hook-chain-thing, and boots. All of these parts were new to Lobo, but several of them have seen re-use since. The parts are pretty well sculpted, and do a suitable job of bulking Lobo up a little bit. Also, the chain on the hook is a real chain, which is a nice touch. In general, Lobo is a good example of how great the sculpted work was on this line. Lobo’s paintwork is fairly impressive; he’s fairly monochromatic, but there’s a lot of detailing, especially on the face and torso. 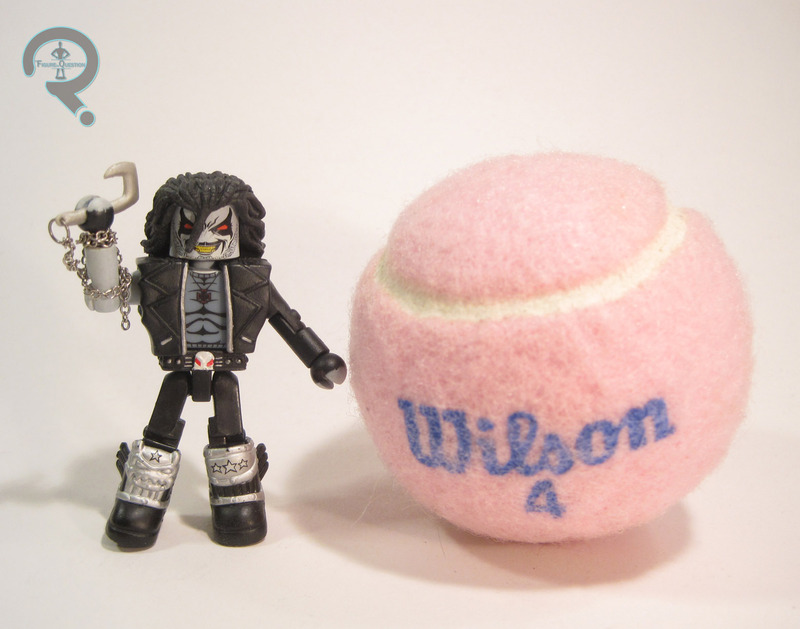 Lobo included no accessories. Ambush Bug is one of the weirder characters in the DCU. He doesn’t really belong to any particular realm of the universe, and he’s almost entirely absent from normal DCU stories, tending to reside in stories set firmly in his own corner of things. But hey, he was played by Henry Winkler once, which is pretty cool. Ambush Bug is mostly a vanilla ‘mate, with one small exception: the antennae on his forehead, which are glued in place. They’re a pretty good translation of his weird antennae from the comics, so that’s good. Other than that, everything’s done with paint. He’s actually surprisingly detailed; DCD could have easily just done a blank green body with only detailing on the face, but Ambush Bug has small wrinkles (just like the ones he has in the comics) on just about every surface. That’s really nice to see and keeps him from being too boring for the average fan. I suppose they could have done him in his casual wear he’s known to wear in the comics, but this is his classic look, so it’s understandable. Like Lobo, Ambush Bug includes no accessories. As with every figure in the DC Minimates line, I picked these two up from Cosmic Comix on the first day they were available. I’ll admit that I was split on this set; I love Ambush Bug way more than I should, but Lobo’s not my thing. At the end of the day, both ‘mates are pretty awesome, for totally divergent reasons. It might be easy to say that these two are part of the reason the line ended so early, but given that the Marvel line just released Dazzler and Howard the Duck together, it’s hard to say.